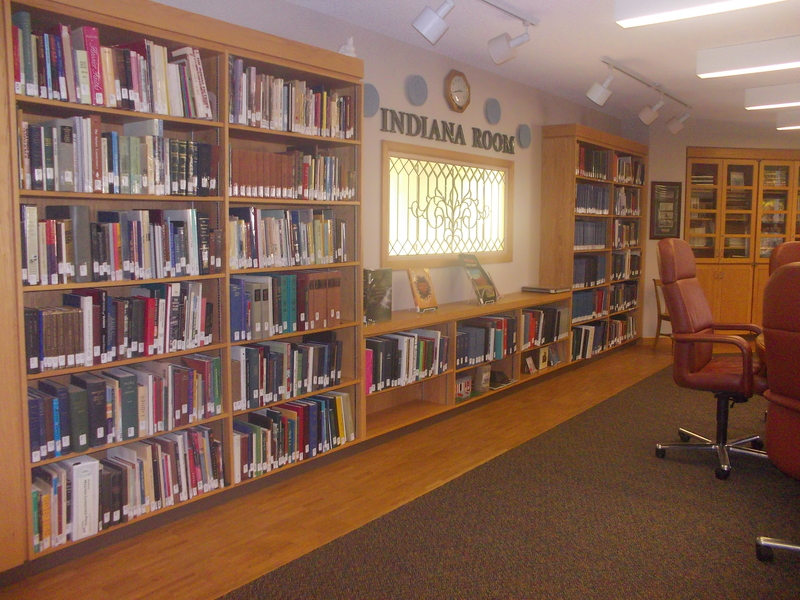 The next section of the library after the reference books is the Indiana Room. The view above is a panaromic view of the Indiana Room. 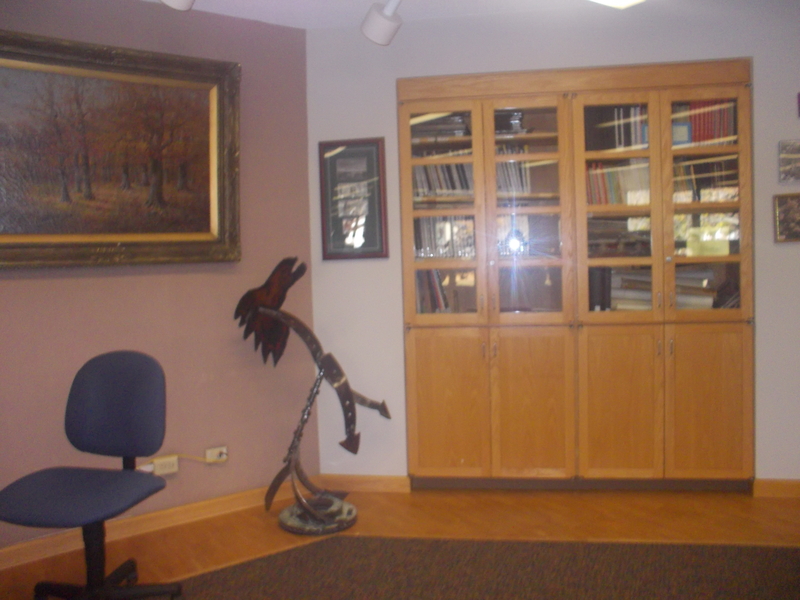 Part of the Reference Department, the Indiana Room offers many amenities. This is the entrance to the Indiana Room. 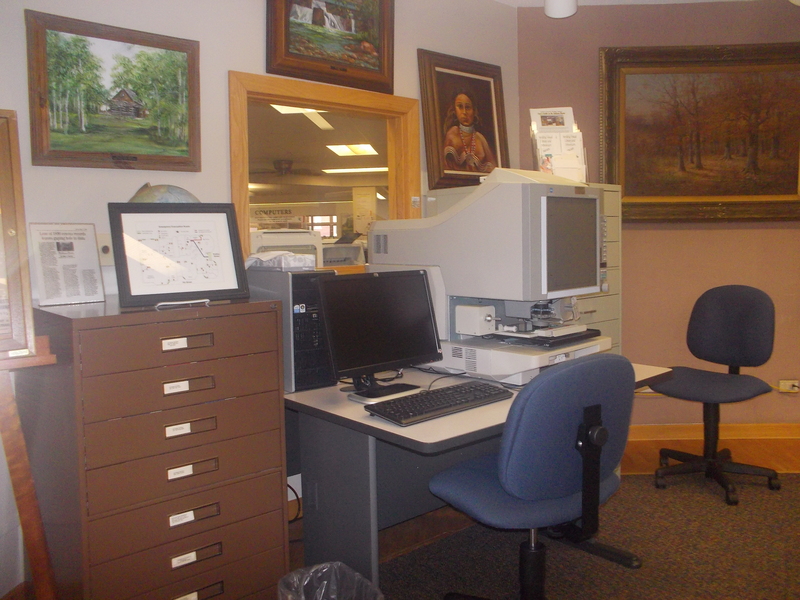 Entering the Indiana Room and turning to the left brings us to the microfilm machine area. Using these machines and accessories, patrons can access archived older newspapers and print them. 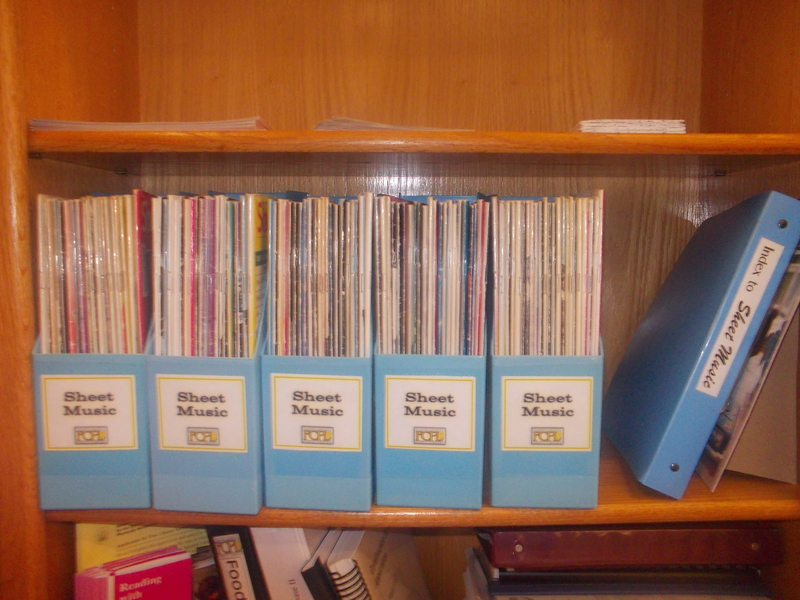 Archived newspapers can be used for various research projects and are also popular for genealogy projects. Continuing to move around the wall to the right showcases a bookshelf containing school yearbooks dating back several years. 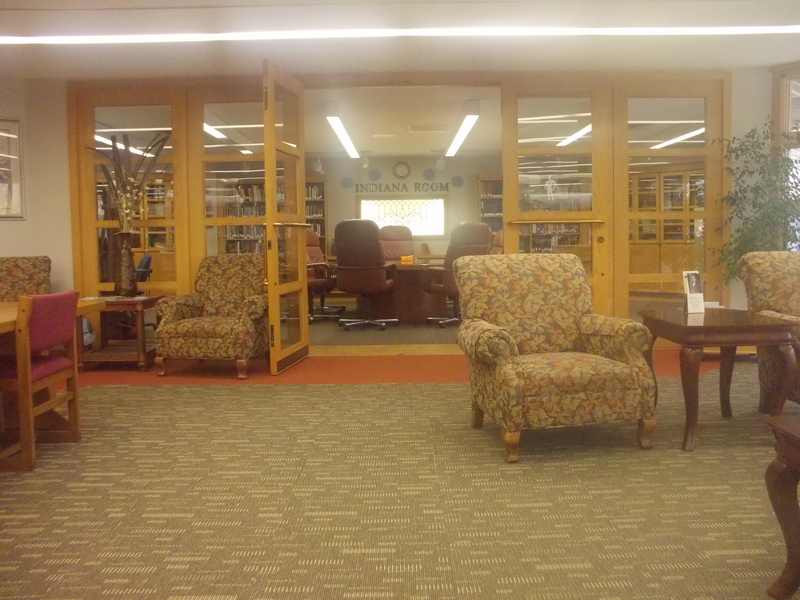 Continuing to move to the right we see bookshelves and another enclosed bookcase. 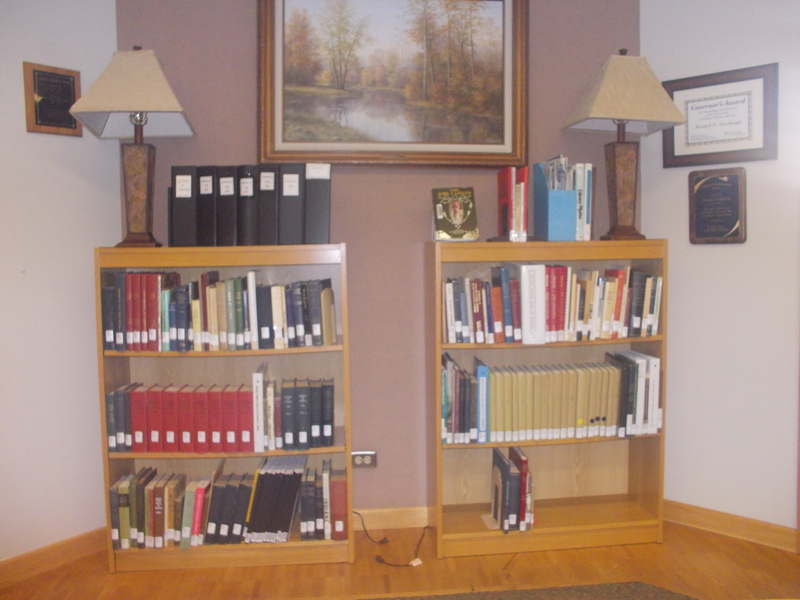 These shelves and bookcases contain Indiana historical books and biographies and various genealogy resources. 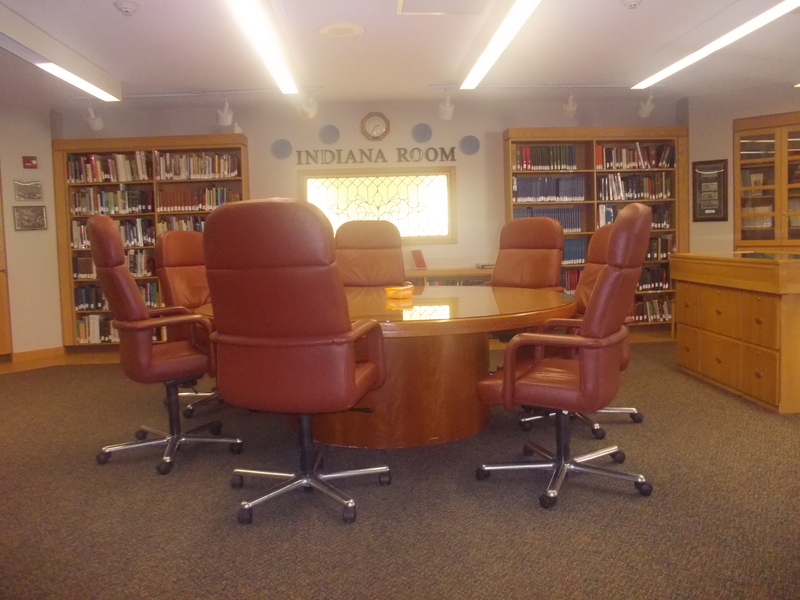 In the center of the room is a large round table that can be used for research projects or smaller group meetings. The room has a projector screen and a portable projector can be reserved to be used in this room. The library board frequently holds public meetings in this area. 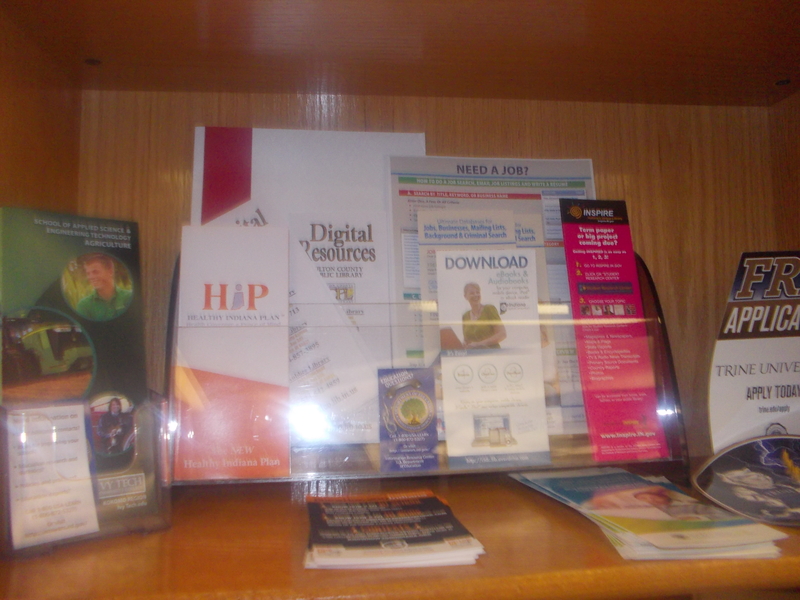 The case seen in the picture to the right of the table is a changing display case. All displays in this room have something to do with the state of Indiana. Continuing to move around the wall to the right of the second enclosed bookcase, we come to a small section of wall with this vertical file tucked between two windows. On top of this vertical file are hanging files for genealogy research. Inside of the vertical file are documents pertaining to Fulton County only and then documents pertaining to the state of Indiana. 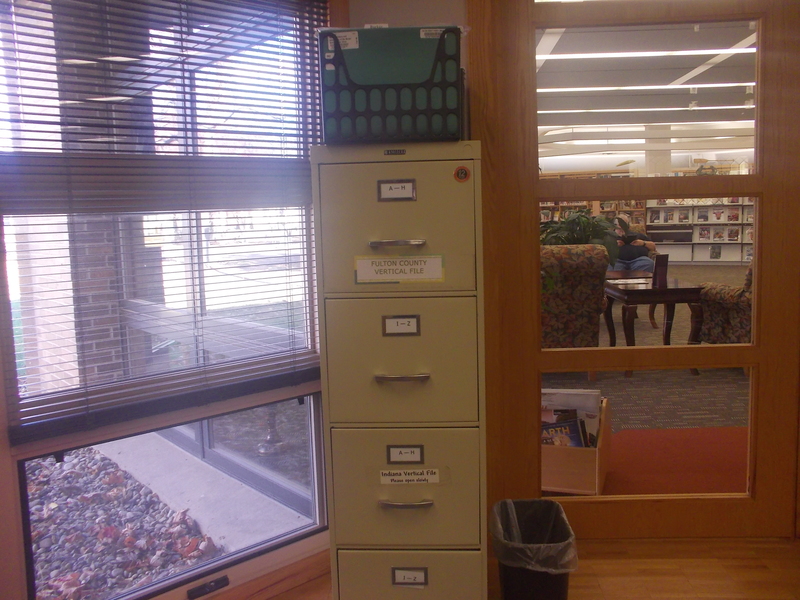 Moving to the right of this vertical file brings us back to the door and out into the Media Commons. and one on one assistance. Ricki Racoon fields many questions from Grant Station and refers more in depth questions to Greta Grasshopper. Typical questions that might be handled in this area involve actual reference questions that have to be looked up, genealogy questions, and questions pertaining to tax forms to mention a few. A patron may not know how to download e-books on their smart devices or e-readers so Greta helps them through the process. Some patrons need to have tests proctured. 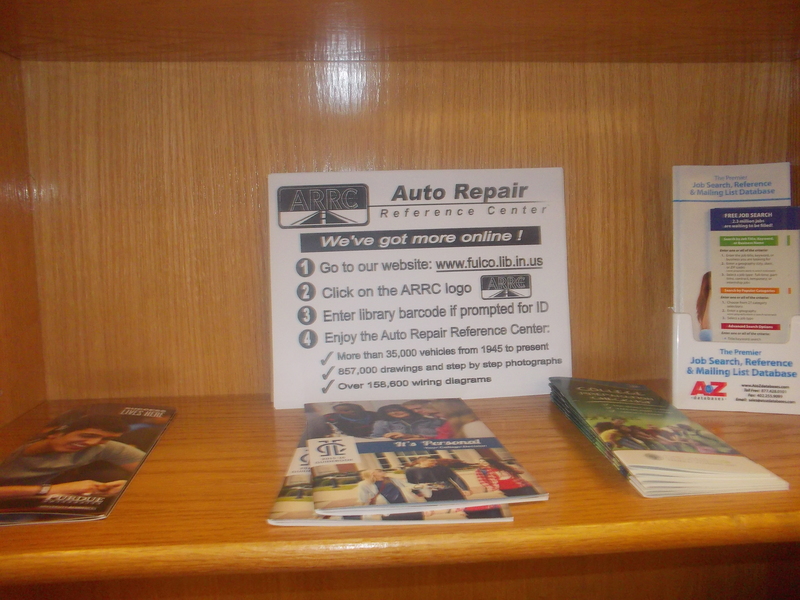 This is a service that the Fulton County Public Library offers free of charge. Greta is usually the staff member responsible for providing this service. When Greta isn’t working with an in person patron, she may be working with patrons on the telephone. 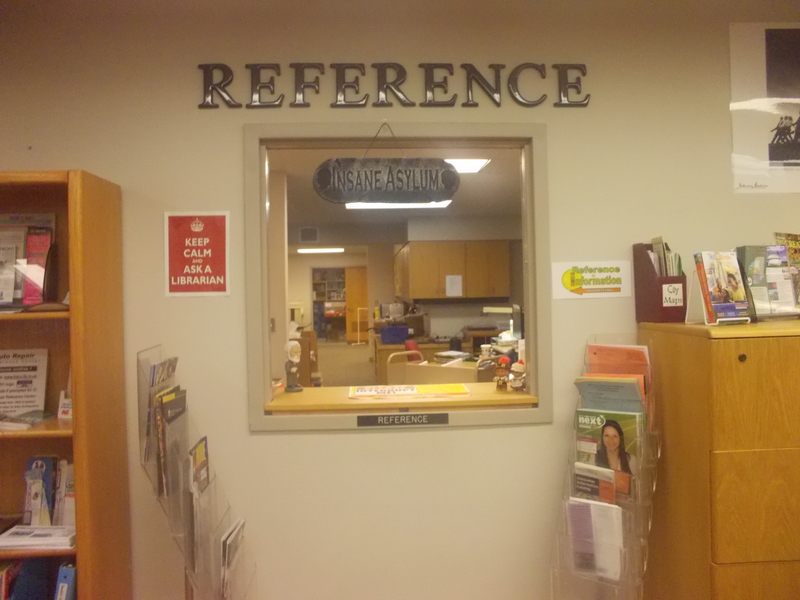 Much of the library’s “behind the scenes” work happens through the Reference Department. In addition to the responsibilities mentioned, Greta orders all of the books for the Adult and Teenage collections. She processes Interlibrary Loan (ILL) requests for books and movies and requests for new library books. Book donations are given to the Reference Department where Greta makes collection development decisions for the adult and teen collections. 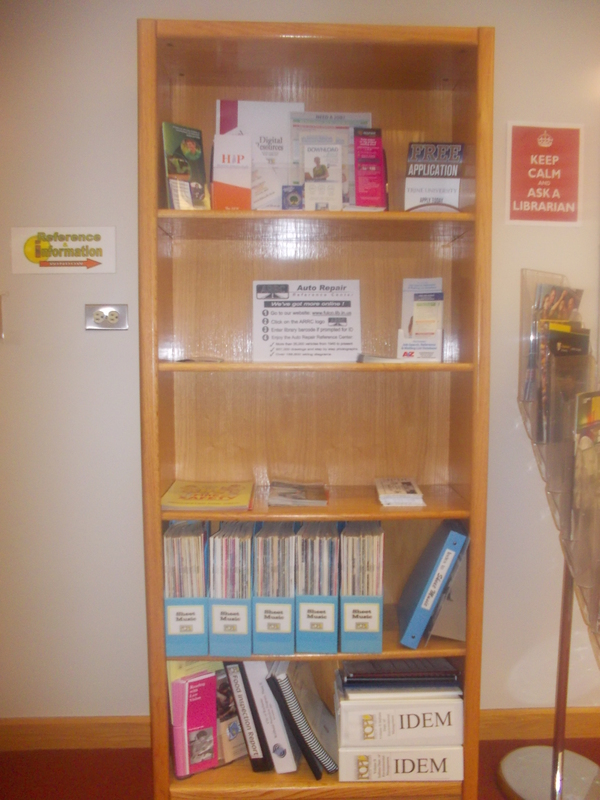 (Children’s book donations are handled by the Children’s Department.) 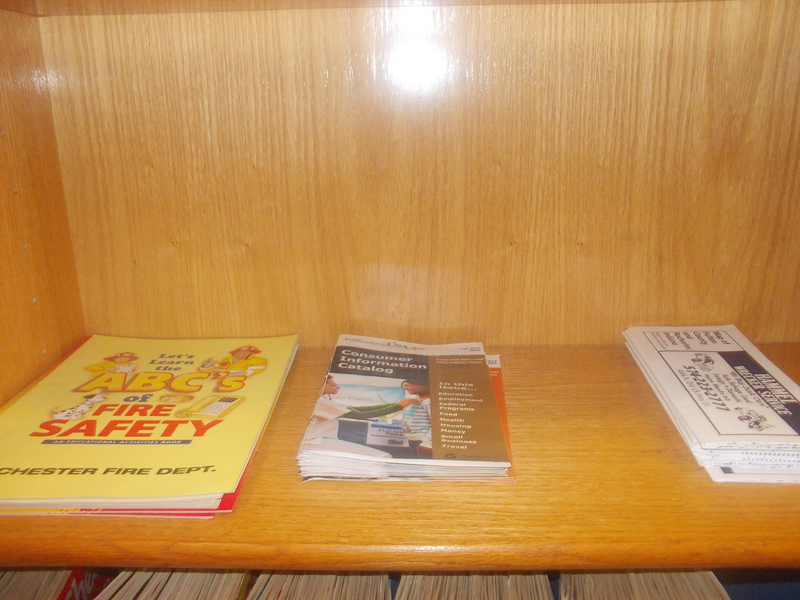 Some books are sent to Technical Services to be cataloged for the library. Other books may be designated for the Friends of the Library monthly book sale, outreach programs, or even be used by various library programs. 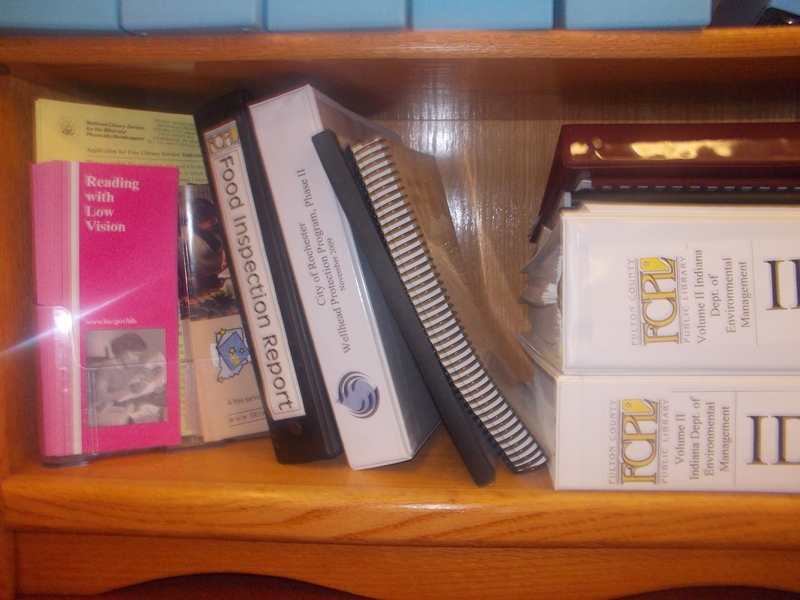 Hard copy reference books and the Indiana Room are also part of Greta’s responsibility. All of the above is quite a bit of work and on extremely busy days, it can get rather crazy. 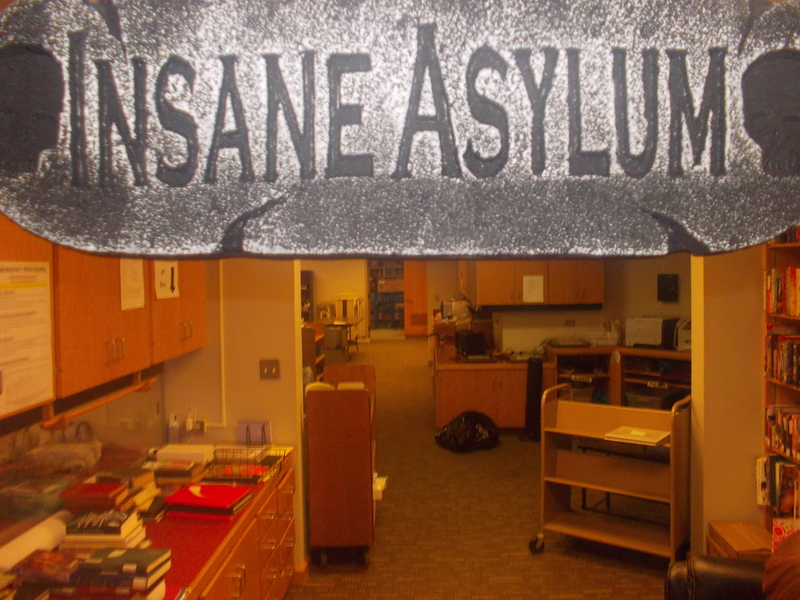 The Reference Department employees show their collective sense of humor by posting this sign. 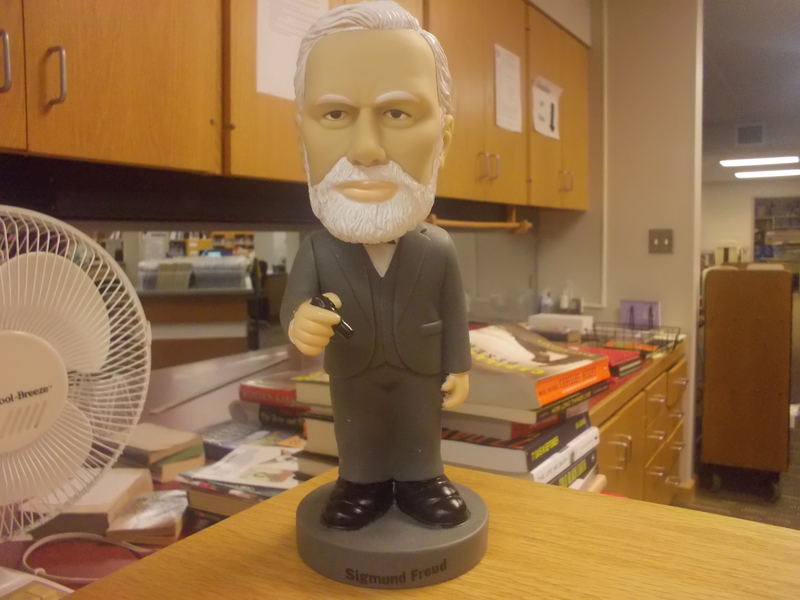 No asylum would be complete without it’s own resident shrink which explains the presence of the bobble headed Sigmund Freud. It’s unclear if the staff want to give counsel or receive it. The patron should evaluate this on an individual basis.